The subtitle of this post could be "Original Blackmagic Customers Left Out in the Cold". There was an interesting thread over on the Blackmagic Forum yesterday. It seems to work. Thanks and kudos all around. But BMCC shooters soon realize that the fix is for the BMPCC only and does not fix their camera's similar problem. BMCC shooters are not amused. Thread devolves into angry ad hominem insults and oaths to 'never buy a BM camera again'. I have been tempted over the past few days to turn around and sell my pre-ordered (April 26th) BMPCC at a mark-up as soon as it arrives (they're selling for $1300-$1400 right now on eBay) in order to "upgrade" to a $1995 BMCC. But why sell a camera that the company is actively working to fix - in favor of a camera the company has ignored for over a year? Upon reflection, I think I'll go ahead and open the Pocket Cinema Camera when it gets here - at the very least so I can shoot the detailed side-by-sides with the GH3 I've promised everyone. 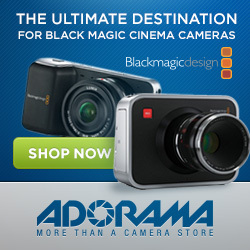 If you're in the market for a GH3, a BMPCC or a BMCC, please click on one of the links above or the display ads below. It won't cost you anything extra, and it will help to keep these posts coming. Thanks!